(NaturalNews) If your child is challenged with Attention Deficit Hyperactivity Disorder, chances are you have both doctors and educators demanding you put your child on medication. Take heart. There are natural ways to help your child. First and foremost, diet plays a crucial and primary role in managing your child's health and symptoms. Diet management is simple, but overarching. Your child needs the healthiest possible diet, but then again, don't we all? The healthiest possible diet consists of 80% raw, fresh, organic produce – more vegetables than fruit. This means salads, chopped up veggies to snack on, carrot slaw, coleslaw, kale salad, spinach salad, apple salad, fruit salads, smoothies and more. Whole foods are both nourishing and healing. If you eat meat, be sure it is organic. If you eat dairy, choose goat or sheep milk and cheese. Be sure to include healthy fats in the diet like coconut oil, avocados, and flax seed oil or a high quality, beneficial, fatty acid supplement. Make sure your child's diet is high in B vitamins or supplement B complex. Of course, choose a whole food vitamin if you are supplementing – never synthetic. If your current diet resembles the American Standard Diet, you'll be focusing more on what not to eat that what to eat. To begin with, eliminate all artificial flavors, colors, and preservatives. No BHA, BHT, MSG, trans fats, GMOs, high fructose corn syrup (or any corn syrup), and seriously limit or eliminate all sugars except raw honey. Never, under any circumstances, feed your child artificial sweeteners. It wouldn't be a bad idea (at least in the beginning) to eliminate gluten as well. After several weeks on a really clean diet, you could add it back in and monitor results. If your child has any known food allergies, completely eliminate offending foods. Children with ADHD often have issues with heavy metals and other substances they need to detox. For children, it is best to work with a knowledgeable health care provider who practices chelation therapy and detoxification protocols. The proper diet (as mentioned above) provides on-going detoxification the natural way. Make sure your child's diet includes fresh garlic, onions, and cilantro – all of which aid in detoxification and chelation. Adequate, quality sleep is essential for ADHD challenged children to maintain impulse control and focus. Do you know how many hours your child requires? Do bedtimes in your home allow for this much sleep, including wind down time to fall asleep? If your child has difficulty sleeping, again, this is another area where B vitamin supplementation may help. 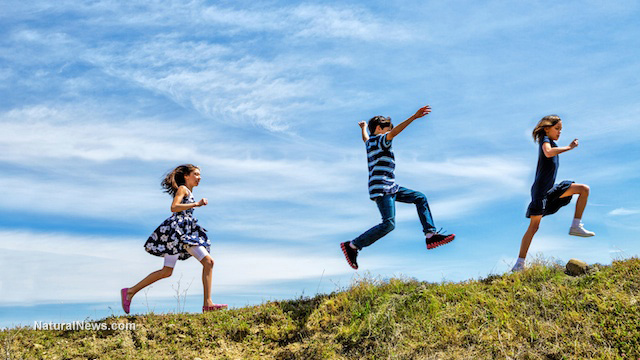 Hyperactive children need to run and play. The more they exercise, the better they sleep and the more control they have over their bodies and their attention. While skateboards, roller skates, bikes, trampolines, and the like will all be great aids for these kids, don't forget that lack of impulse control leads to risky behaviors. Increased supervision may be required. Identify and celebrate your child's strengths and unique abilities. Your child needs to develop a healthy self-esteem, and there is little to no chance this will happen through the school system. Throughout your child's formative years, the message from most of the adults in his or her life will be one of disappointment, disapproval, and from some, disbelief that ADHD is real. Your unconditional love, respect, and appreciation will provide the emotional foundation your child needs to develop a healthy sense of self. ADHD is caused by poor functioning of the frontal lobes of the brain. Everything that can be done to improve gut health, hormonal balance, and overall health will help control symptoms. Grounding or Earthing may help as well. To learn more about a healthy diet, check out 80% Raw Food Diet. For more on natural ADHD remedies check out How Candida Leads to Depression Anxiety ADHD and Other Mental Disorders and see the first two sources below.